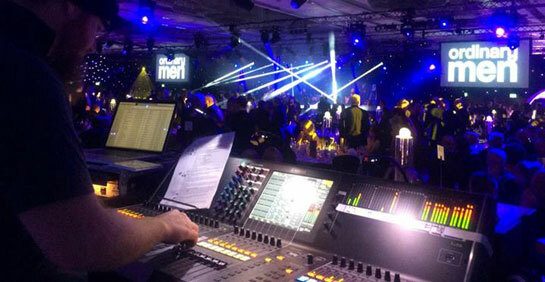 Our main area of expertise is in the operation of sound equipment. We have over many years improved our inventory of equipment to satisfy the ever increasing demands of our customer base. We have everything from iPod cables to a full concert system. Everything is available as a dry hire or with engineers for 1 day up to long term. Rates are based on the spec of the artist, venue size, times of show, equipment used and travel expences. For a complete quote please contact us. All our crew are trained and know exactly how to lift, stack, plug in, & operate. All our equipment that has a mains electrical connector on is electrically tested once a year in March in order to comply with government regulations, along with being individually visually checked before going out on hire. We have public liability insurance for anything that we do; again certificates are available upon request before the event. If you are unsure whether or not you need certificates or what this means please contact us and we will advise you on the matter. We also can PAT your equipment too! This is by no means a comprehensive, brand by brand list; this is just to give you an idea of the kind of equipment we can provide. For information on specific makes/models/technical specifications, please email or telephone. Using Litedeck, we can accommodate any stage size. Handrails, treads, ramps and steps will cover all accessibility requirements and roof structures are available for outdoor events. We have been requested to install sound & lighting equipment for some time now as of 2008 we now do installs, weather your old system needs a tweak or you need a complete new one we can deliver. We get no specific deals from any one supplier so our advice is not biased in anyway. Whether it is a new guitar cable or a specialist cable for legacy equipment we can make it for you. We make our cables from only the best manufacturers such as Neutrik, Klotz, Van Damme, Amphenol, our cables will last the test of time. We can also wire up your racks with custom looms and patch cables.